The 8619538 module works on other pre-CEM. The other STC modules don’t want to work on CEM cars with the 8619538 module. I’ve had no problems like this on the non-CEM cars. You can put an AWD module on a pre CEM car with STC and it will work, along with the regular STC module. 8619538 module is soldered differently than all of the other Teves MK20 modules. You can open one up and see zero cracking on any of the pins, even using a magnifying glass. The only cars I’ve seen this module on is the CEM cars. 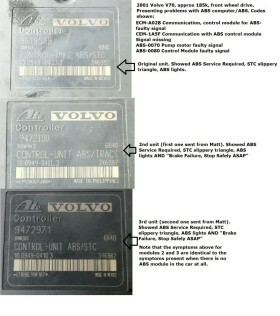 Read more about this: V70 ABS Failure: Module NOT the problem! help? Hi, can you tell me if the 8619538 CEM module be repaired. i open mines up and checked it even with a magnifying glass and did see any cracks. When to the dealer today, drove over 165 miles to let the them check but they assured me it was the ABS module causing the ABS liight to be om. Now I have two troubles the flywheel is out. I am in need of a fly wheel and module. I have a 2000 volvo nonturbo S80 with 2.9 litre. If you can help me, I will appreciate it.